Unlike most of the top Android phones available today, this model is more compact, so it will be easier to use for most users. And we focus on “more compact” because a year or two ago, the Mini would have been considered very high. But things change and evolve. Compact format by itself does not entail sacrificing autonomy and performance in everyday use. And that is why I liked the Galaxy Mini a lot. For details, I invite you to read the review until the end. The Mini has a screen diagonal of 4.3 inches, and if we follow current standards can be classified as a medium sized phone. For me, it is large enough to ensure a pleasant user experience, but compact enough to be able to grab it firmly and use it with one hand. Moreover, Mini approach more on ergonomics than the phone I currently use, the iPhone 5, even more, feels a little better in the hand, thanks to slightly rounded edges and a wider casing. 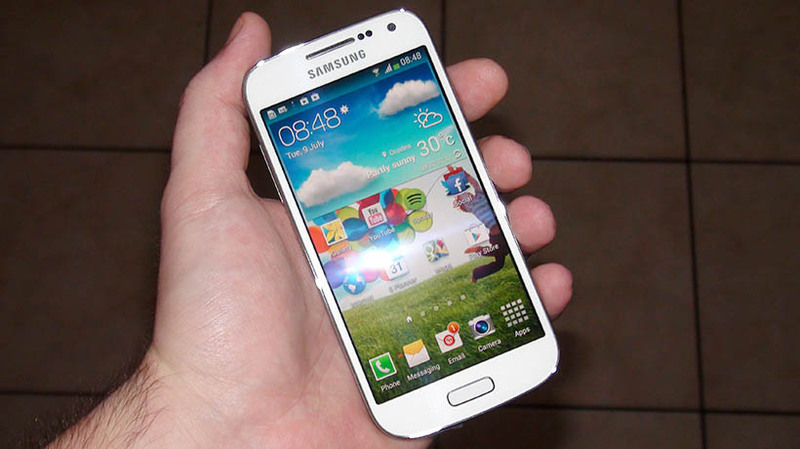 The Galaxy S4 Mini is actually a miniature replica of the top model from Samsung, the Galaxy S4. Looks identical, they offer the same set of ports and buttons have largely the same facilities. Furthermore, the S4 Mini meets the same glossy plastic casing, removable battery and penetrations to hide SIM and microSD cards that are placed under the battery, so you have to stop every time the phone if you want to access it. The folks at Samsung have mounted an AMOLED panel on this phone, and not one with PenTile matrix as we usually meet. As a result, the display provides excellent contrast and viewing angles, strong colors, but saturated, slightly unrealistic. Meanwhile, the screen on the Mini receives only qHD resolution, which attracts a relatively low pixel density, in turn translated into images not extremely clear. This will be noticed by those who are already accustomed to higher resolutions screens, but should not be a major inconvenience for most users. Like any Galaxy, that runs on Android Jellybean 4.2.2 version to be precise, with the TouchWiz from Samsung. The S4 Mini meet most applications and functions offered by the renowned S4, with few exceptions, but we will discuss this a little later.